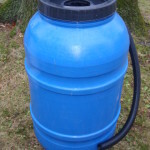 220 litre / 55 gallon repurposed food grade plastic rain barrel. 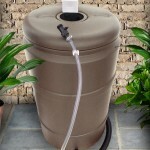 Includes leaf and mosquito filter basket, spigot/tap , overflow adaptor and overflow hose. 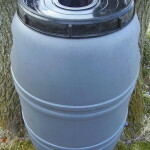 Overflow adaptor permits rain barrels to be connected in series. 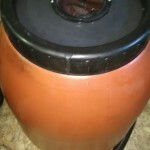 Dimensions are approximately 23 inches wide and 38 inches tall. 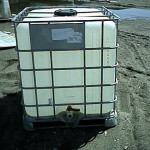 Weight is approximately 20 lbs.